The intranet app provides you all of the tools to create a heirarchical listing of content. This app allows you to create categories, and choose between 3 types of content to store within those categories: articles, files and links. The innovation within the intranet app is that each category's contents are listed on the category listings page. The intranet app's main purpose is to provide you with the functionality to create heirarchical content structuring. While this is named an "intranet" app, it can be easily altered to provide you with a product catalog, or any other type of content listing that requires heirarchical listings. 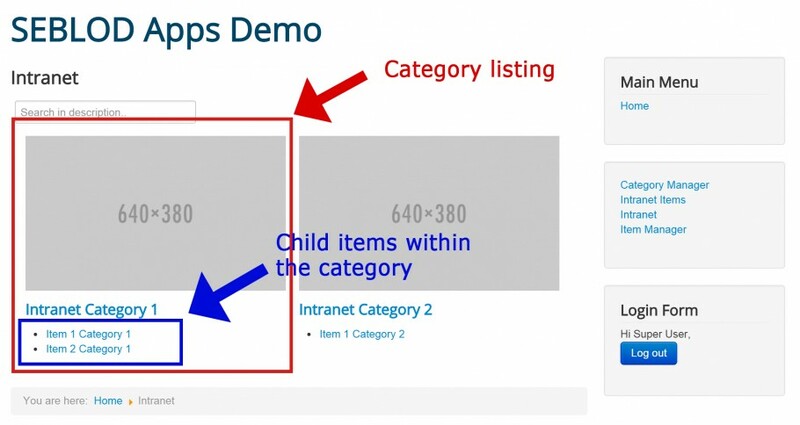 The intranet app achieves it's heirarchical listing structure by utilising the SEBLOD List Field Plugin and the intranet category's intro view. Get started with this app by first creating a category. You can do this easily through the front-end Category Manager that is installed with the app. In the Category Manager, click "Add New" and then enter the relevant contents about your category. After you have added a category, you can add an intranet item. 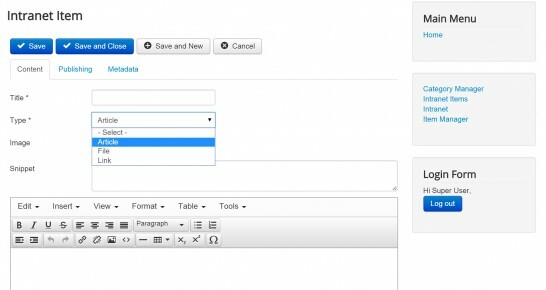 Intranet items can be added through the front-end Item Manager that is installed with the app. After clicking the "Add New" button, you will be able to add the information for your intranet item. You are able to choose between 3 different types of content to store: Article, Link or File. Selecting these will reveal relevant additional fields depending on your choice. In the 'publishing' tab, you can assign your intranet item to one of the categories you have created previously.